Just a few of the lucky participants in the military-enforced 70th anniversary celebration. POSTON, AZ—Commemorating the internment during World War II of nearly 120,000 innocent Japanese-Americans, U.S. authorities this week reportedly tracked down and apprehended thousands of the now-elderly detention camp survivors for a 70th anniversary reunion. 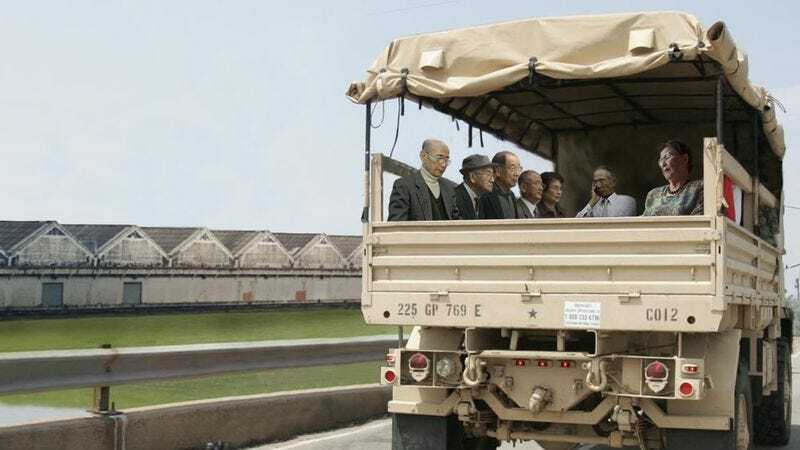 Packing the onetime detainees into buses, armed guards forcibly returned them to their cramped, ramshackle barracks at the Poston War Relocation Center—just one of many sites across the country in which aging Japanese-Americans accused of nothing more than their ancestry have been given the chance to revisit a powerful, formative event from their pasts. “The celebration is mandatory,” Lowry added. According to sources, though many of the Japanese-American survivors are now in their nineties and suffering from various forms of dementia, a flood of memories from their youth came rushing back when they were once more summarily expelled from their neighborhoods and forced to abandon their homes, businesses, cars, and pets. After being processed at the internment center, stripped of contraband, and deloused, the newly reinstated detainees were reportedly astonished to discover that with the exception of a festive “70th Anniversary Celebration” banner hanging from its gated entrance, the camp remained largely unaltered, its facilities featuring the same rustic sanitary facilities, lack of adequate shelter, and dangerous shortages of food and medical supplies. The returning inmates are said to have partaken in many of the same activities that filled the days of their youth: huddling around makeshift campfires, using unpartitioned toilets, and building their own classrooms out of adobe just so they could attend school. This familiar routine, Gilmore said, has allowed the seniors to revisit that special place where they spent a substantial portion of their young lives. “We’re just so glad we were able to this before it was too late,” she added. Stressing the importance of continuing to honor the rich legacy of the internment experience, Gilmore told reporters she believes the nation as a whole is doing just that. “Most Americans are celebrating the anniversary by doing what they’ve always done: pretending none of this ever happened,” she said.